An octagon electrical box is a common type of box that is typically used for installing light fixtures on a wall or ceiling. They are usually made of metal and come in standard sizes of 4 x 4 inches, and in depths of 1 1/4, 1 1/2, and 2 1/8 inches deep. Octagon boxes aren't true octagons—they're more like squares with beveled or clipped corners. This shape is better than a square box for matching the round bases of light fixtures, so that the box is easily hidden when the light fixture is installed. Octagon boxes come in a few varieties for different applications. A standard octagon electrical box is a plain metal box that can be mounted directly to wall or ceiling framing (wall studs or ceiling or floor joists) with wood screws. 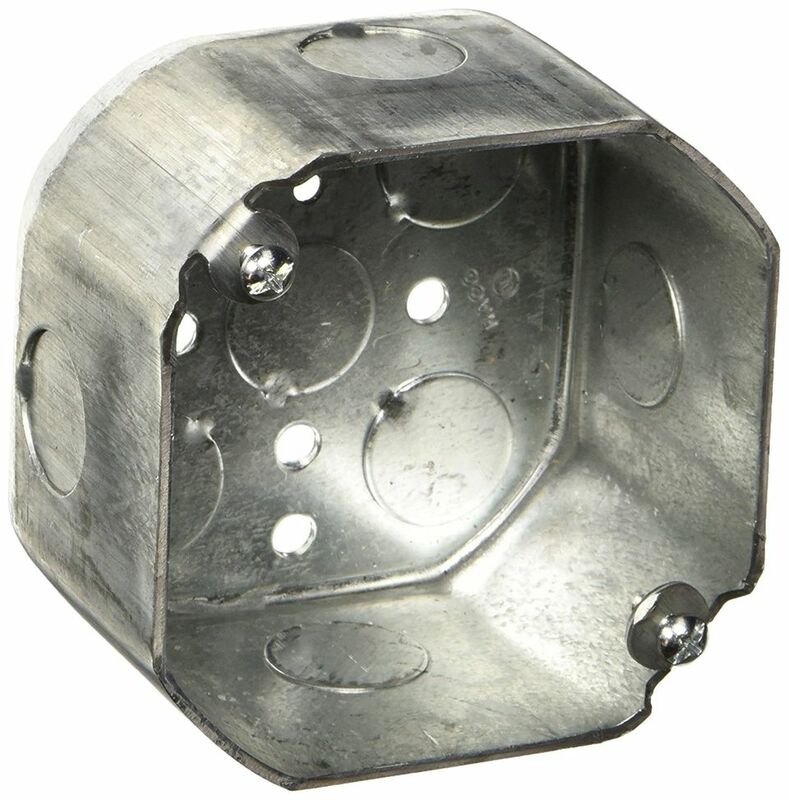 Some have brackets for mounting to the sides of studs or joists. If the box location falls between two framing members, a standard box can be mounted to a piece of solid-lumber blocking installed between the members. In this case, the back of the box lies flat against the blocking and is secured with at least two screws. This makes for a secure connection for heavy light fixtures and even ceiling fans, if the box is properly rated and the screws are strong enough. Octagon boxes with braces have adjustable metal braces, or bars, that extend outward to meet with framing members on either side of the box, allowing installation anywhere between two framing members (an alternative to using lumber blocking). They are used most commonly with ceiling fixtures but are also suitable for wall-mounted lighting. Braces typically are screwed to the framing, and some heavy-duty braces feature an integrated mounting device that drives the braces into the framing with a piston-like screw device. If a box is labeled "new work," it is a standard type that is designed to be installed during new construction or remodels when the wall or ceiling drywall has yet to be hung and the framing is fully exposed. "Old-work" (sometimes called "retrofit) boxes have special mounting devices that allow you to install the boxes when the drywall is already in place. Standard old-work boxes usually have mounting ears that secure the box to the drywall as you screw in the box. Braced boxes for old work have screw-piston devices on the braces that allow you to anchor the box without having to cut a large hole in the drywall. The load rating is the amount of weight a box can safely support. It is critical to use a properly rated box for each fixture and to mount the box and fixture as designed. Standard octagon electrical boxes may be rated to support up to 35 pounds (depending on the installation method), while boxes with lightweight braces may be rated for only 10 or 15 pounds. Heavy-duty ceiling fan boxes may be rated for upwards of 50 pounds. Never install a ceiling fan onto a standard octagon box; you must use a box (and bracing) designed specifically for ceiling fans.